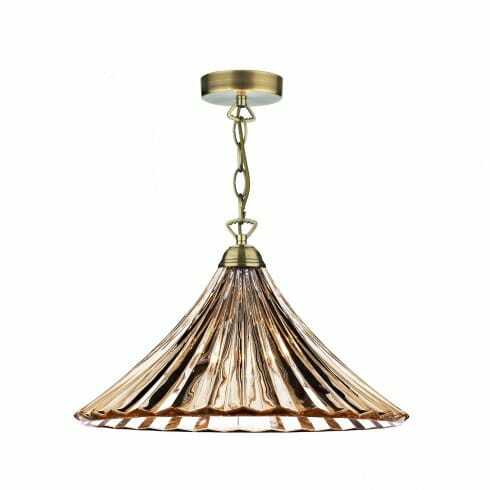 Dar Lighting Ardeche single light ceiling pendant features an antique brass fitting supporting a flared ridged amber glass shade. The product code for this Dar ceiling pendant is ARD866. This charming ceiling fitting is perfect for both modern or traditional decors within your home and will add a vintage, retro look. Height adjustable at the point of installation and comes supplied with 100cm if cable and chain. Also available in polished chrome with a clear glass shade, which can be viewed on our website.